Driving more and more visitors to a Blog, turning them into a loyal constant reader, getting so many pageviews and thereby making more money from a Blog is the main goal of almost every Blogger. But how many Bloggers can make this long-term goal come into reality ? Only a few, if you are patient and hardworking enough then you'll probably end up to be among those few. This post is all about T-shirt marketing, a method to expose your Blog / Brand to the world and get so many followers, blog readers, unique visitors and even regular customers, but do you know the most intriguing part of this method ? It is hardly used by most Bloggers, infact I presently don't know of any neighbouring Blogger that have used or that is presently using this method, maybe there is but I wasn't aware then. Although, there are so many ways to let people be aware of your brand which includes online advertising, guest posting on other related blogs, blog commenting, email marketing and so on; most of these methods are online while the one we are talking about in this post tonight is offline. Now, lets go straight to the point. Few months ago - November 2013 to be precise, while sitting down and thinking about how to make more money and make my online business boom in the year 2014, I started to think about different ways to make my Blog & Brand - "StevenBergy.Com.Ng (#SBCN)" so exposed that the Blog will be a better one and will grab the attention of many teens, juveniles, adults, ladies and gentlemen who have so much interest in Technology and Tech-related updates then a thought which I never knew will change my Blog struck my mind. 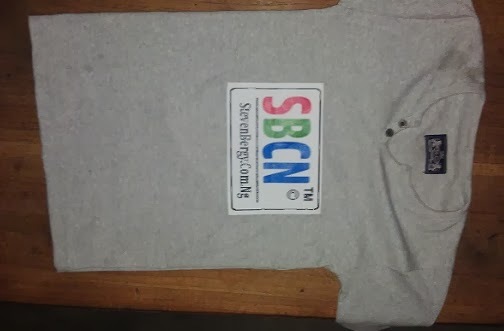 I thought of designing and customizing a T-shirt with my Facebook Fanpage, Twitter Profile, Blog Title and Blog URL all over it; a beautiful one indeed. Without wasting time, I calculated the amount of money I had to spend on this and also listed the advantages of doing this over spending the money on other blog exposure means then I realised Its better to take the little risk and see what will happen. LoL...Did I say little risk when I shouldn't even use the word risk at all because I didn't risk anything, it only costed me #3000 ($21) which some of my friends even said it shouldn't be more than #2000 ($13). Let me explain, I went to a boutique for shopping that day then I saw a nice T-shirt (Body Hug) which looks tight and lovely on me then I paid #1000 ($7) for it and took it to someone who printed my already-designed logo, blog title and URL on it for #2000 ($14) = #3000 ($21). Can you believe the first day I wore this T-shirt, I was glowing almost everywhere I am ? So many people noticed the colorful logo, name, brand, fanpage, twitter, blog URL and blog title on it. That same day, different people asked me questions about my Blog which I answered and enlighten them, i now have some of them as friend on Facebook, fan on my fanpage and readers on my blog. Also, I noticed new likes on my fanpage and blog views also increased which is a sign that my T-shirt is speaking for me. Since then, every time I wear this T-shirt to the Bank, to Work, to School, to Social Gatherings etc. - I always notice the wow effect and cool smile on people's face when they see it. Now, just imagine I have up to 10 of this T-shirt and gave my friends, colleagues and siblings. Don't you think they will also help promote my Blog / Brand every time they also wear it ? Yes they will. Seriously, this method is a very quick and simple way to get people notice you and your Blog very fast. Thanks to Websites like Zazzle that allow customers to order customized T-shirts and wears of different sizes, colors and shapes. Just head to Zazzle and make a beautiful and attractive design of your Blog or Brand with your Blog's title, URL, Fanpage and Twitter Handle on it, that is if you cannot do it the way I did mine but if you can, its better to do it the way I did mine because it will save you a whole lot of money. 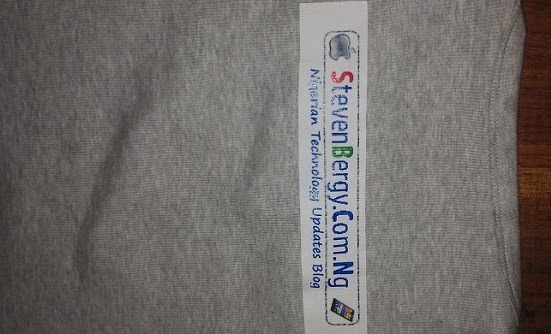 By Jehovah's grace, I'm planning to make a very beautiful T-shirt with a better attractive design and give it out to my Loyal Blog readers just to show my appreciation and being grateful for their support on StevenBergy.Com.Ng and doing this will also attract more audience to my Blog and also expose my brand incredibly. You can also do the same if you also own a Blog, its really good to give; Giving is better than Receiving. Right ? To be candid, this post is very long. Thanks a lot for reading it to this paragraph, its just another means of Blog exposure, Brand building and Traffic generation that worked for me and I hope it also works for you too if you do it the right way and also think outside the box. Please note that I don't think I'm a professional Blogger and this post is not meant to boast about anything, rather than just to let everyone (especially newbie bloggers) know how to take their Blogs to the next level. What do you think about this interesting post ? Kindly add your contributions, thoughts and suggestions by using the comment box and don't forget to share this post with your friends, colleagues and other bloggers by using the share buttons below. Stay tuned to #SBCN to get more updates directly into your mailbox. Have a wonderful weekend and wishing you a fever-free February. Cheers !!! 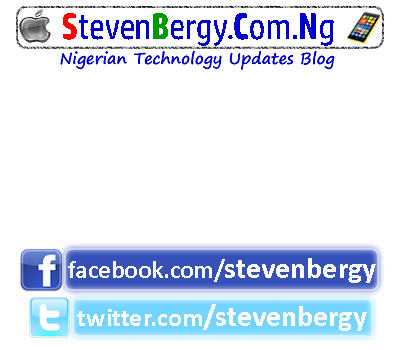 Thanks, a post will be published on this Blog when we are about to give out the T-shirts so you'll be aware. Just keep reading and don't be anonymous next time so you'll be recognized. Nice idea,i have always thought of something like this,but never thought it will yield any result.Permission to try it sir? Thanks for the comment Ebima, you are always free to try it out bro and please let me see yours (T-shirt) when you're through with it. Let me know if it also works out well for you. Best wishes !!! Tattoo my Blog URL on my body ?.. When I'm not Michael Scofield...LoL. Thanks a lot for dropping by Bro, really appreciate that. Hope to see you some other time. Thanks Bro, You should consider doing that ASAP.. You know now, there should be no dulling this year ooh. Seriously i have been thinking of this for a while now but i was actually thinking doing the design on cloths and giving them to orphanage, people in the streets and more. 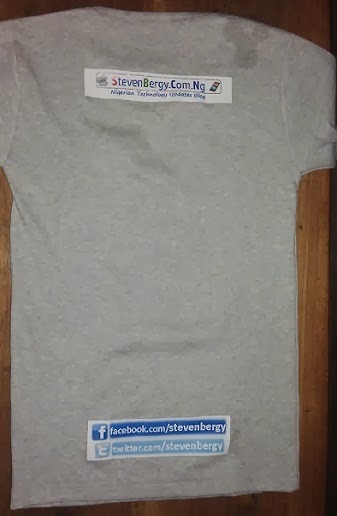 Following your post, guess i will just try a personal t-shirt first before going public. Nice One Samuel, But assuming it's the orphanage you distributed it to.. You wouldn't get any positive result because they wouldn't view or expose your Blog because they are mostly children and they hardly go out but you need teenagers / adults that will wear it and move from one place to another, thereby exposing your Blog to others and they will also keep visiting themselves. So you can try the personal shirt first, Best of Luck Bro.